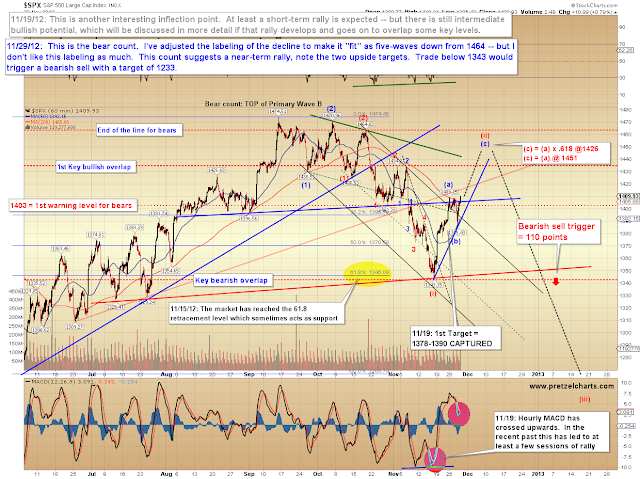 Last update expected the correction to continue over the near-term (though I published no official target for a bottom), and also noted that the rally to that point appeared impulsive, suggesting that the next-larger-degree trend was still up. 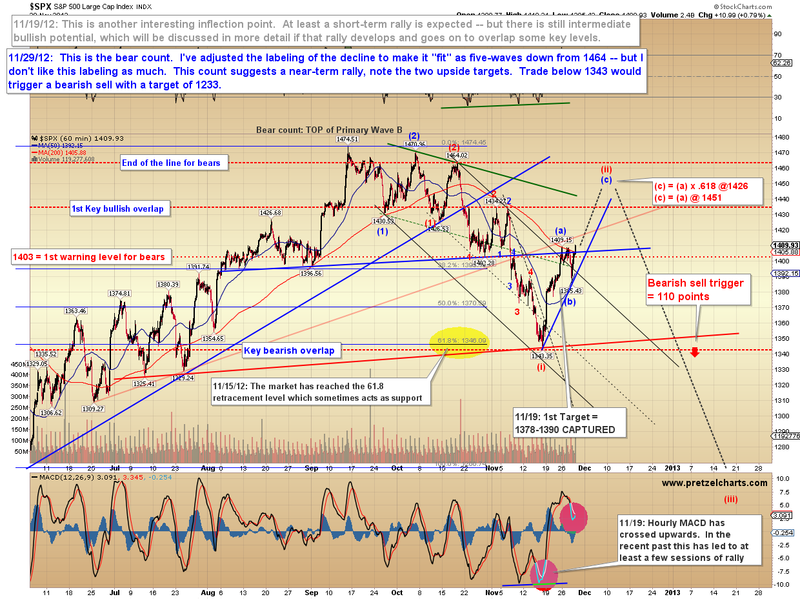 Yesterday, the S&P 500 (SPX) found a bottom at 1385 and put in a very impressive bullish reversal. On one of yesterday's charts, I included a very specific annotation: "Trade below 1391 that holds above 1377 and subsequently breaks above 1409 is likely to lead to a relentless rally for several sessions." 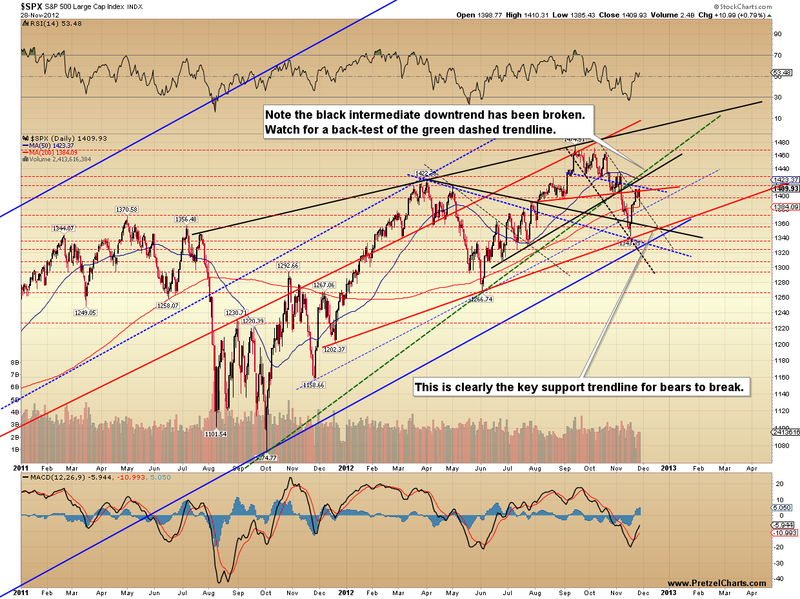 This is exactly what happened yesterday -- so the up-trend is thus expected to continue over the near-term. 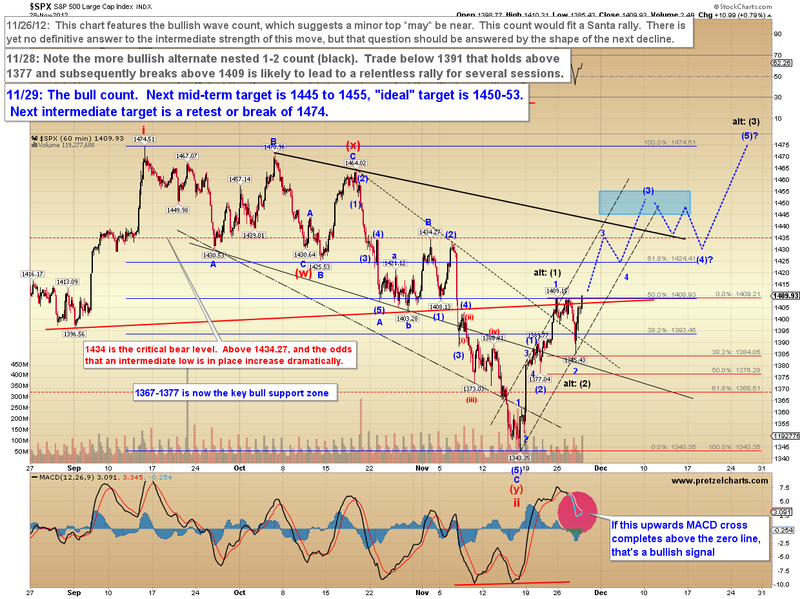 The market has now allowed me to calculate some new, additional upside target levels to (hopefully) tack on to the 30+ points we captured on Thanksgiving week. From a longer-term perspective, I still believe the bulls have a slight edge, but there's yet no key markers to eliminate the bearish wave count, so we'll continue to track its progress and expectations for the time being. Bears should take note of the strength and speed of this rally, which is eclipsing the last decline, and indicates that bulls may have more firepower in reserve than bears do. What's really nice is that both the bull and bear long-term counts are again aligned over the near-term, which is always helpful for trades utilizing shorter time-frames. First up is the daily chart of the SPX, which notes a few key trendlines, and shows that the long-term uptrend since 2009 still remains intact (indicated by the blue trendline, which goes back to the 2009 lows). 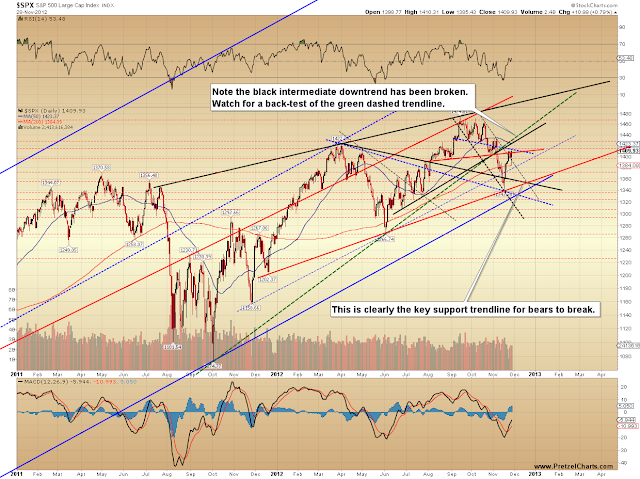 The lower red trendline is now a three-point validated trendline, and thus likely the key support for bears to break in order to take control of the long-term. 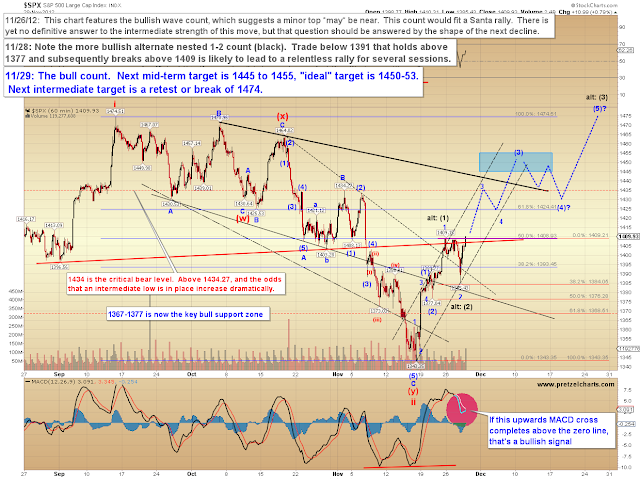 Below is the bearish wave count, with the next-tier targets for that interpretation. Though I like the targets noted on the chart above a bit better, there is resistance near 1425, 1430, and 1435 -- and (c) would equal (a) x .618 near 1426, which lines up with 1425 resistance, and is thus worth watching (if we get there, of course). I remain watchful of a large number of charts not shown in this update, such as the US Dollar, several other indices, and a number of key indicators. Some indicators are on the cusp of declaring a new bull leg in equities, but I'm loathe to get too far in front of this market while it remains in what is essentially a giant chop zone that stretches back to the beginning of the year -- so I'm going to remain primarily focused on the near-term until my intermediate indicators get on the same page. The good news is that, presently, both the bull and bear intermediate counts are pointing toward more upside for the near-term. Trade safe.